Marcellus Hall is a New York illustrator whose brilliant rendition of Rockefeller Center on an overheated Earth made the cover of The New Yorker in January 2016. 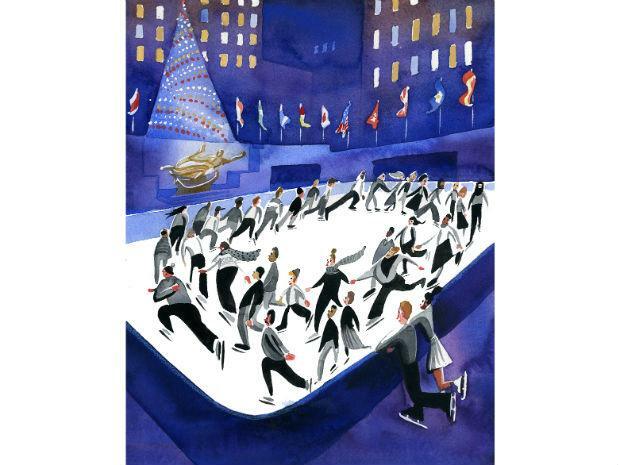 Recently he also painted a more wintry, luminous watercolor of the Rock Center rink, which was accepted into the annual Society of Illustrators competition last year. 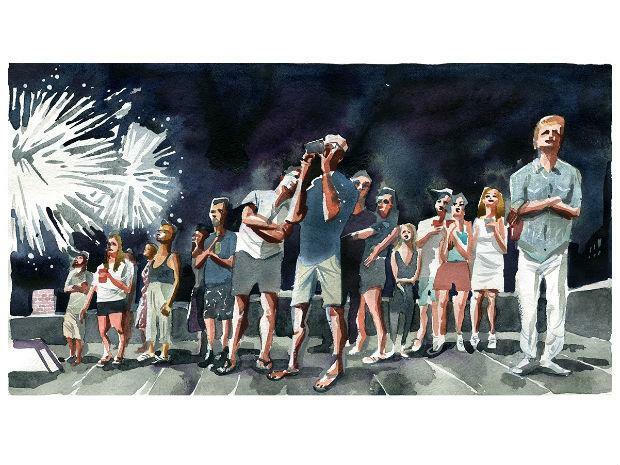 The Minneapolis native, who has illustrated children’s books, written a graphic novel and toured as a musician, has a particular fascination with scenes of NYC life. We caught up with Hall at Bar SixtyFive to find out more about his inspirations, big breaks and finding the quiet side of the city. You moved to New York right after college at RISD. What really struck you when you first moved here? I think it was the motion, the constant motion and the flux of people on the streets. And the variety. I really was mesmerized when I stood on a street corner, and it doesn’t happen as much anymore, but I do remember just literally standing there kind of stupefied. But I was looking at everybody’s face, and I was maybe sketching or maybe not, but either way I was absorbing it. I remember thinking this is really weird that I’m so mesmerized by this, much more than TV. When you’re sketching people, what are you noticing? What draws you to them? I love caricature and I feel like it sort of conveys personality when you exaggerate people, even if it’s not their personality per se, it still says something about individuality and I love that. So when I’m seeing all kinds of people I’m amazed that we all have two eyes and a nose and mouth but we all look so different. It seems like in caricature you’re finding the difference and accentuating it. And there’s a certain essence that’s extracted when you caricature, hopefully. What inspired the New Yorker cover? I’m always just looking for things that would fit the bill for them, and juxtaposing things is one way. And it was probably coming up on winter and I knew the skating rink would be put in place. 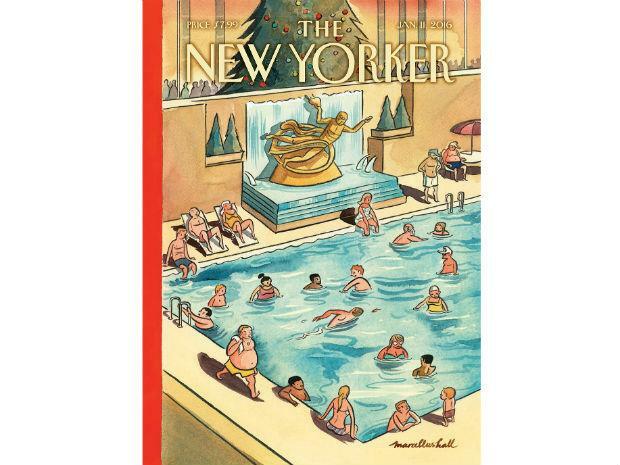 I sometimes go to websites of New York City to jog inspiration, so maybe Rockefeller Center popped up and then I thought, oh, well global warming is one of those things that The New Yorker would love to talk about, so it hit me somehow to make a swimming pool instead. Yeah. I did that in 2008. They approved it, I painted it, they bought it and it was done, and then it got printed in 2016. They were waiting for a really warm winter… it took eight years. Did you start to think they weren’t going to print it? I almost forgot about it. It’s weird ’cause you never know. Even when they tell you your cover’s gonna be printed next week, I check myself. How did you start illustrating for them? In the ’90s you brought your portfolio around to magazines, they had drop-off days and you picked it up a week later. And they’d put a little note in there that would say thank you and they would sign their name, if they were nice. So Chris Curry hired me, and after that they just kept on hiring me and I couldn’t believe it… I was illustrating articles, so they sent me to plays, they sent video tapes of movies to me and it just kept coming and it was amazing, and then when David Remnick took over in the late ’90s I remember the art director telling me, oh we got a new editor and you’re one of the few artists that he decided to keep. So they kept hiring me, and at one point I got bold enough to ask, “What about the covers?” And they said you have to talk to this other art director. Françoise does the covers. So then somebody put me in touch with her and I introduced myself, I think she just said, yeah, go ahead and submit. I started in earnest, and I thought this is the chance of a lifetime and I just spewed forth ideas. The first year, I just sent them so many ideas, and a couple of them caught their attention. They said, this one looks good, maybe give this one a tweak here or there. I’d been submitting for a year and then that one got in. The Adam and Eve one. That must be a dream when they get in touch and say this is going to be a cover. What do you feel? I felt like no way, no way… But I remember handing it in, and they said it’s gonna print and I just didn’t tell anybody. 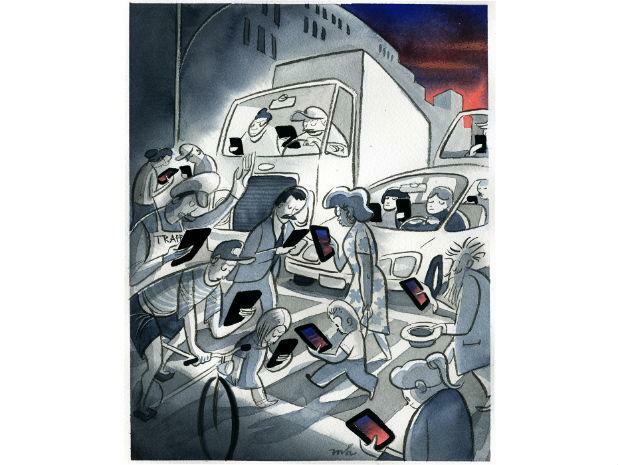 I just waited and waited and waited, and finally the day it happened I said look at The New Yorker. Both of your Rockefeller Center images have a really different feel. In the watercolor of the rink, the tree’s more stylized, it’s more about a mood. What inspired you to do that one? There was something about the romance of skating, and just trying to conjure a winter theme for a cover idea. The art director said to me, you know, there’s no joke here. And I knew that. But I also knew that occasionally and even more frequently lately they print covers with no joke… I just thought it was the romance of skating, and the motion. It feels like it’s about the motion because you have the circular path of the skaters and the tree and the flags. And the rink sort of glows. Yeah. Good, I mean that’s exactly what I was painting… That’s partly what I’m doing now when I say I’m inspired by personal projects, I took that on myself, I thought to myself if it’s not a cover, at least it’s going to be a cool painting that I want to make. 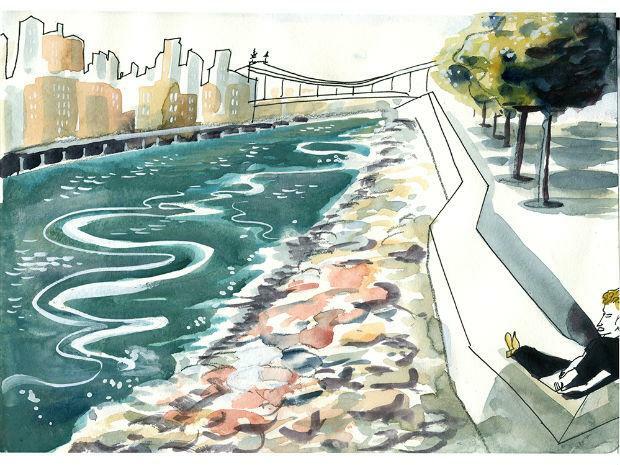 In your new book, Kaleidoscope City, there’s a lot of solitude, but it’s also romantic. How did the project take shape and what did you discover as you developed it? 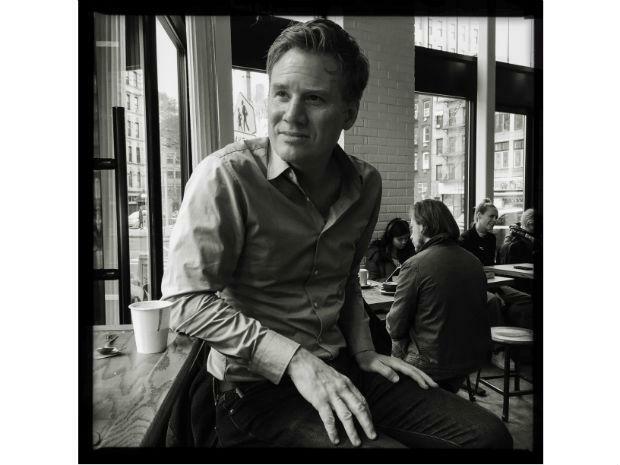 I discovered that you don’t have to start with a script, because I was impelled – is that a word? – I was impelled by an urge to romanticize existence in this context of the city. And I knew I wanted to make a book because I love books, but I couldn’t get my head around a story and I didn’t really want to anyway. I decided to just make drawing after drawing and see where that would take me, and it took me somewhere. I amassed a lot of drawings and then tried to create a semblance of narrative around that. The writing followed the drawings. Yeah, which is a little bit backward but I feel like it’s valid. It definitely works. 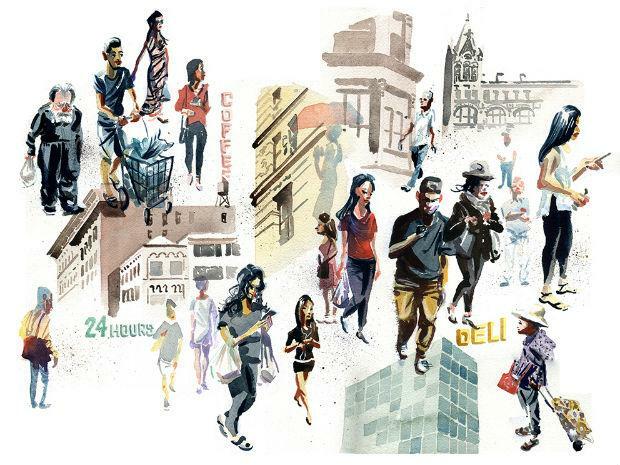 People think of the city as really busy and hectic, but the artwork in the book is pared down, so there’s a contrast, it’s about New York but it’s also quiet. I was probably trying to preserve some aspect of solitude, like you mentioned, in the drawings. And there are moments in the city that are quiet. It’s rare, but it’s true. 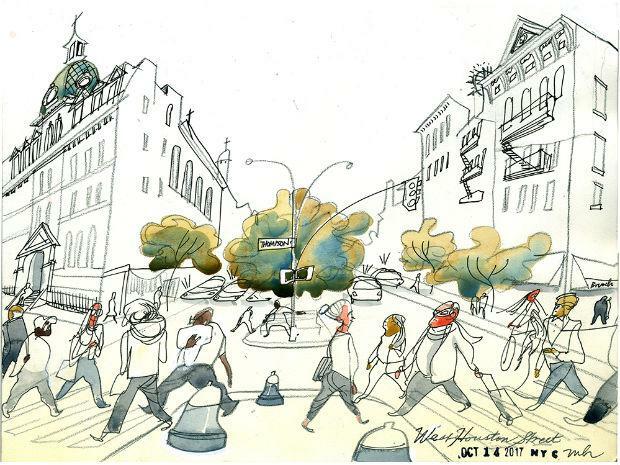 See more of Marcellus Hall’s work in the slideshow above and on his website, and keep up with his art on Instagram and Twitter.